It’s not a bad snow. Not really. There are times I can’t see the barn from the house. When we can barely see the vehicles parked there. 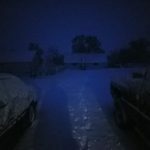 Today was a wet snow. I spent lots of time worrying about the two horses who’s last winter was spent down south. What if they’re cold? What if their coats don’t get thick enough? What if they’re shivering? I went out and checked a few times bringing gifts of cake with me. They were chilly, feeling all hot and silly like they get. No one was shivering and the snow wasn’t melting off their backs. I left them. They have all the hay they can eat and the run in to keep them warm. 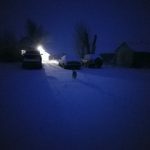 Tonight the snow had slowed down but it was a dryer colder sort of snow. I went to bring them in. Not because of the snow its self so much. Instead because they were soaked from a day of wet barely freezing snow. 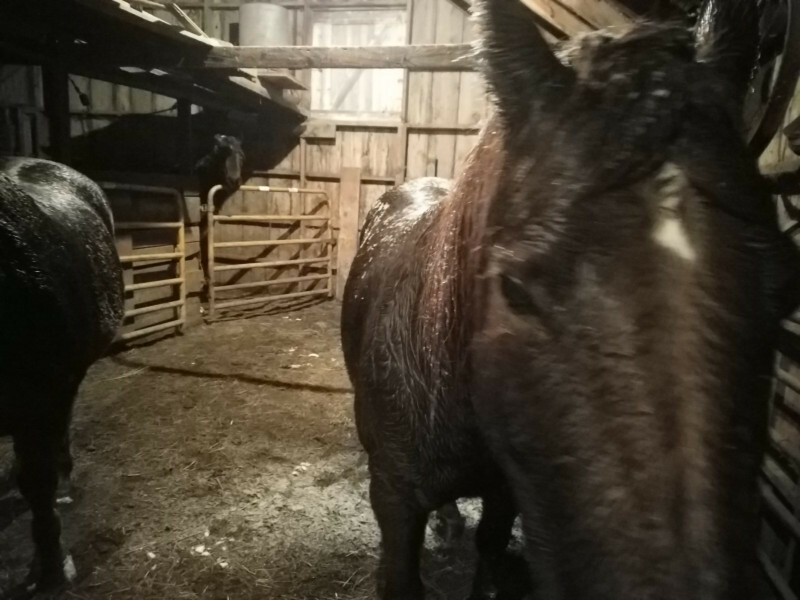 Give them a chance to dry off and warm up for a few hours then they can go back out. 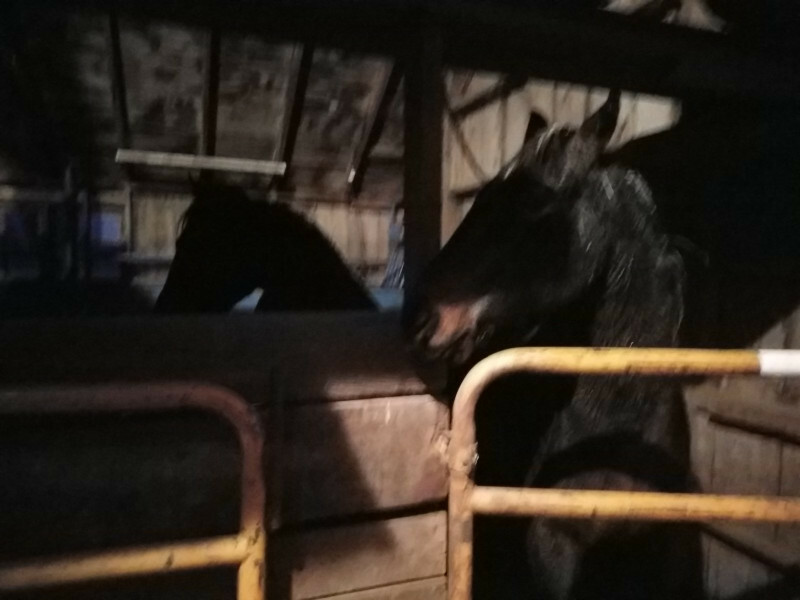 Coyote likes to be in the barn during storms. Onna wouldn’t hardly go in the door without being forced. Rusty doesn’t care but likes food. I didn’t know what the two new ones would think. 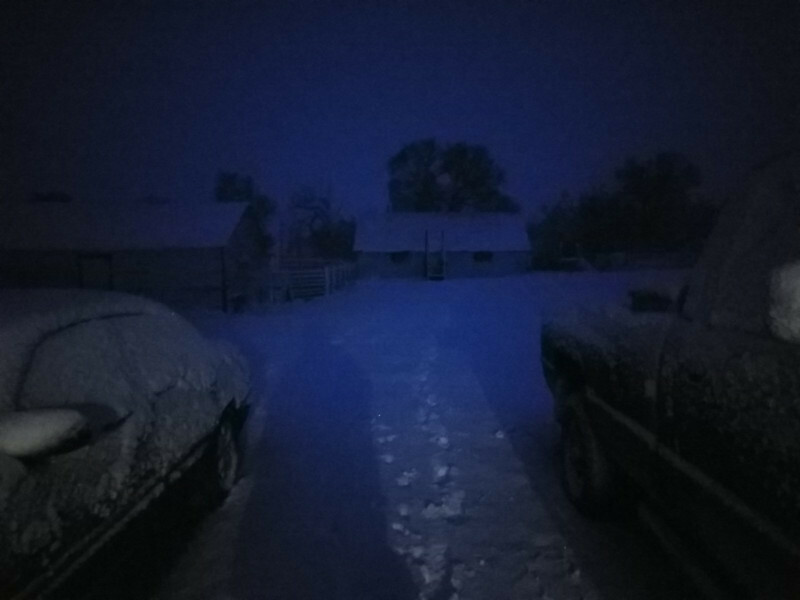 I opened up the barn then went outside and called into the wind and snow. In my mind I was the father from My Friend Flicka, this story might have been from Thunderhead though. When we were kids our mom read to us from my grandma’s college lit book all the time. In it was the exert where he calls Banner and the herd in out of a blizzard. It’s beautifully written. The dad lift his face into the full brunt of the wind and calls. Miles away watching his herd out on pasture in the mountains, Banner climbs to a high peak listening and smelling, gauging the severity of the storm. 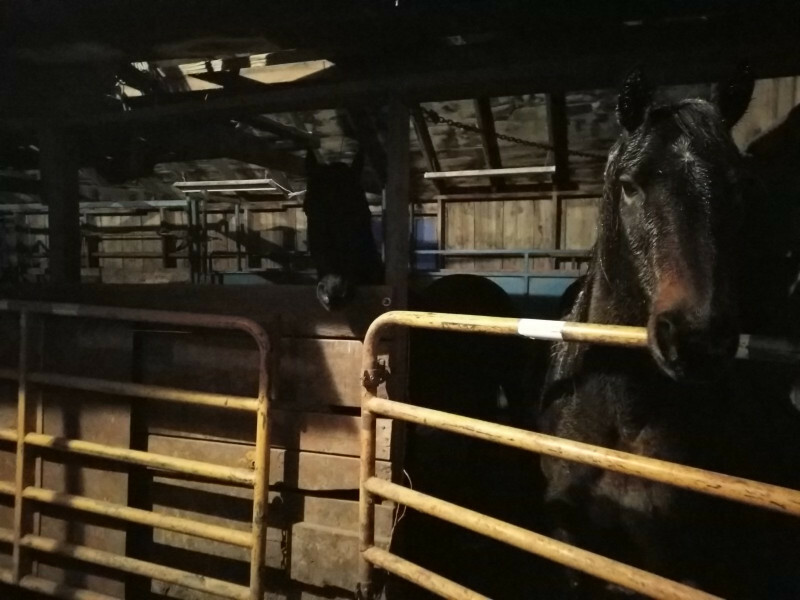 He “hears” the call, or decides it’s bad enough, and pushes his mares and foals away from the shelter they have found and down to the ranch head quarters. Goblin/Thunderhead falls in a hidden draw filled with snow and Banner Jumps down and lifts him by the scruff of his neck, gives him a good shake, and gets him going again. 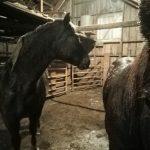 One mare has stepped in a hole and broke her leg. She stands waiting to be eaten by wolves? 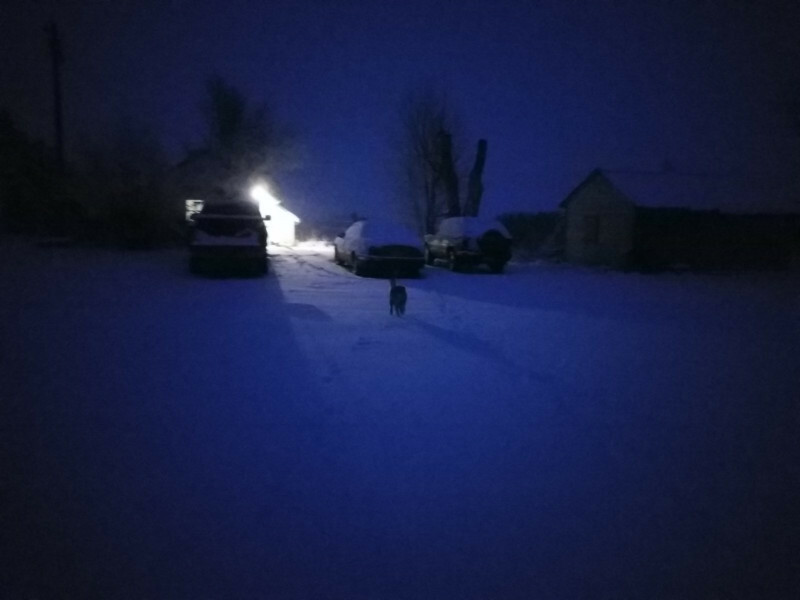 coyotes? foal trembling by her side while the other horses gallop past. 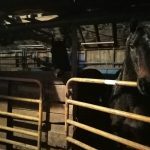 Once the herd is inside the warm barn eating hay and grain, a foal shows up, claw marks down his side, no damn in sight. I don’t remember if it was that same foal or a different one. 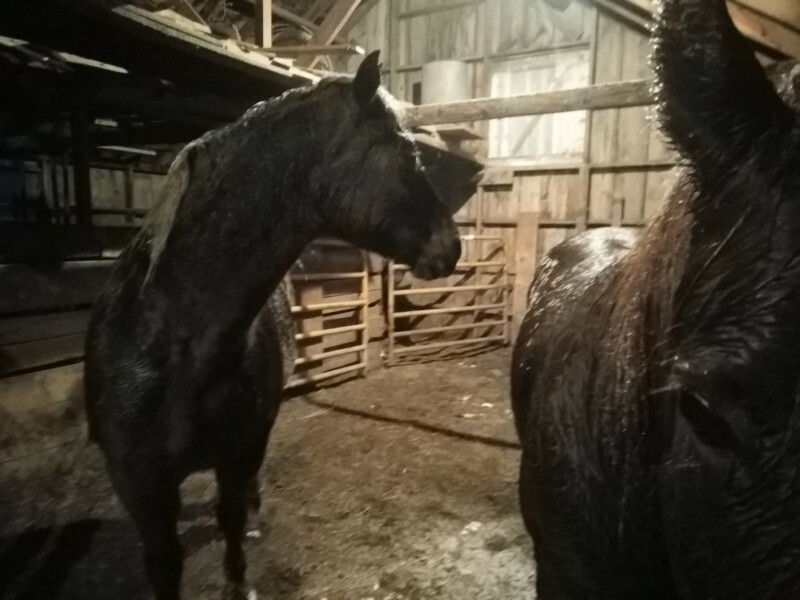 The horses had come in out of the storm. 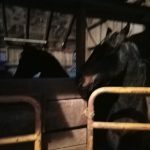 My horses came too. Galloping and bucking. They may have only been on the other side of the corral, not off in the mountains, but they answered just the same. Coyote and Rusty nearly trampled me getting through the narrow door. I locked them in the far stall together. 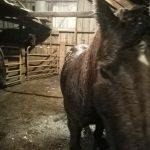 It is set up for working cattle, not a horse barn. It works though. There are two big boxes instead of stalls. I turned from latching the gate and Harvey was already in. Amarillo had to stop and think for a moment then he joined us. The wet steaming horses and I stood a long while. I had brought cake and they were happy to eat it. I had spent the day working on treat manners as a group. They all got clicked and treated as soon as nobody was trying to smash me. Tonight I had to really back Rusty off once as he went after Harvey teeth bared. Rusty was hurt and horrified. He gasped and turned to walk away. I clicked when he was off a ways. He learned immediately and stood nicely back the rest of the time I played with them. I will check on them before bed. If the snow has stopped and they are dry I will let them out for the night. If it’s still wet and icky out I’ll bring them some hay and leave them for the night.